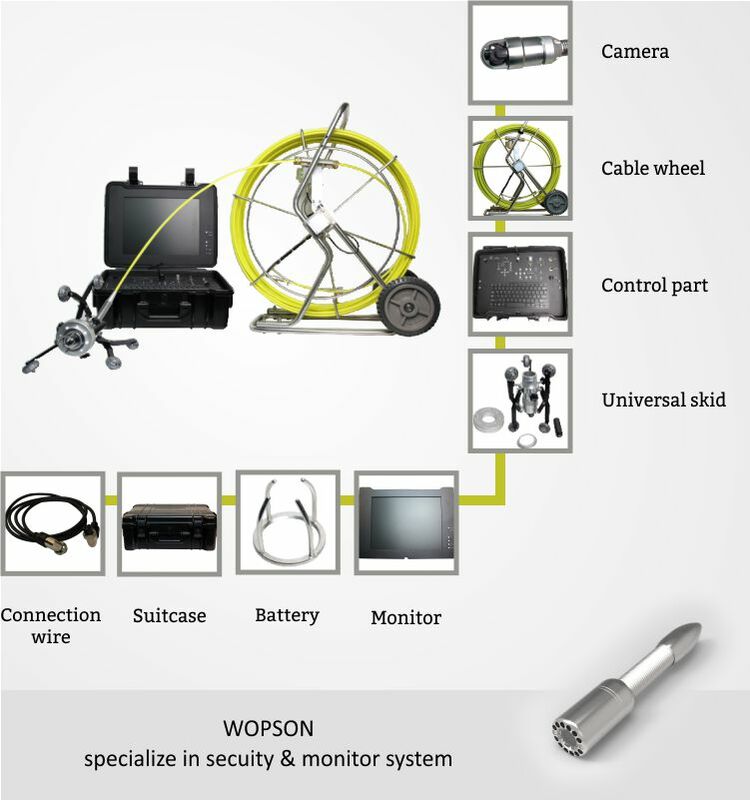 Wopson Technology is the research and development, production, sales of industrial video detection system High-tech companies, mainly in the power industry, petroleum, chemical, anti-corrosion, metal smelting metal products industry, medicine and food and beverage industry users, can fully meet their actual operating conditions in the detection needs. Wopson Brand Industrial endoscope in these industries the user's detection technology advantage is very significant, first, the product cost-effective: and the same grade of imported products, performance and foreign products are the same, the price advantage is obvious; second, the solution is good: can easily solve the above-mentioned industries in the inspection of large space, long-distance detection problems, Other small space testing is also easy; third, rugged, low maintenance costs: Product failure point, suitable for a long time in complex and harsh environment, the internal use of optical fiber conduction, even if the failure, maintenance costs are very low. Four, the product waterproof grade is high, may in 50 meters water depth carries on the normal work, is suitable for the hydroelectric project use. For actual use, I will give you a detailed description of the detection pipeline for industrial video detection system. 1. 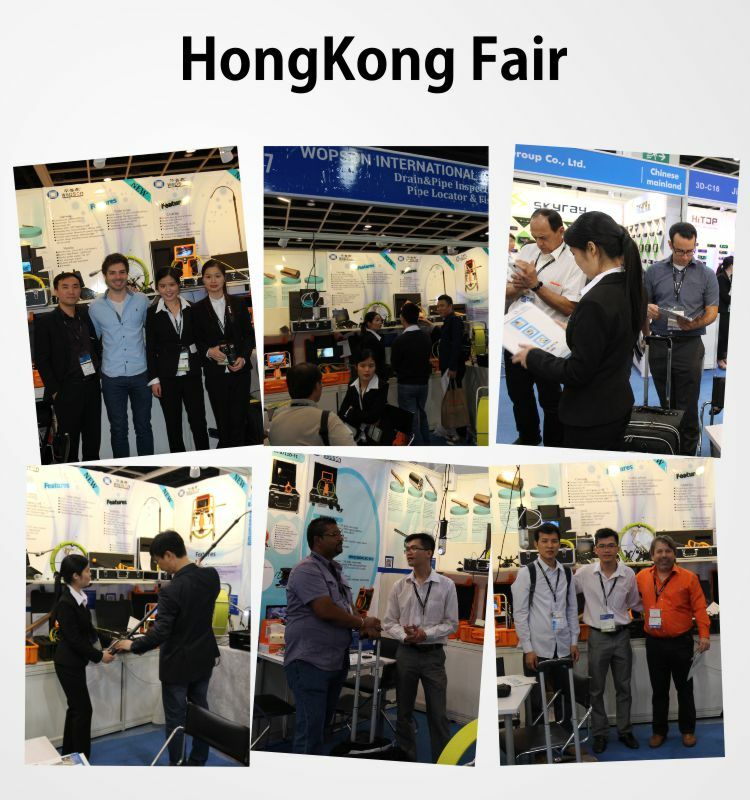 Wide range of testing: the application of more than 18mm pipeline inspection projects, the use of different diameters, functions of the lens makes the detection process easy, and particularly suitable for large shaft center hole video detection. 2. Long detection distance: The configuration of 25 meters (also optional 100 meters) of the detection line, in the case of only a first hole, the detection range can be covered, so that the operator in the detection after the completion of a large number of pipeline welding, recovery. 3. The detection of image clarity ultra-high: the product has a leading international macro-variable Coke segment technology, so that the lens in the macro contact or infinitely far under the conditions, through precision focusing to get the best video effect. This feature is also unique internationally. 4. Because of the use of LED cooling light source lighting program, maintenance costs are very low, light source life of up to 10,000 hours. 5. At present, some imported optical fiber lighting products, in complex circumstances, easy to trample, pull, fold injury, maintenance costs extremely high. The WPS Series products all adopt electronic technology, the detection line is sturdy and durable, the fault point is few. 6. If the equipment fails, the supplier can provide the standby machine in time, so as not to affect the normal duration of use. 7. WPS Pipe Video endoscope is suitable for diameters of 18 mm to 1000 mm, the internal inspection of pipes, containers and larger equipment with a length of 25 m (maximum 100 m) can be used for rapid video diagnosis of cracks, cleanliness, weld connection, corrosion degree, collapse and internal abscission of the internal tube wall. 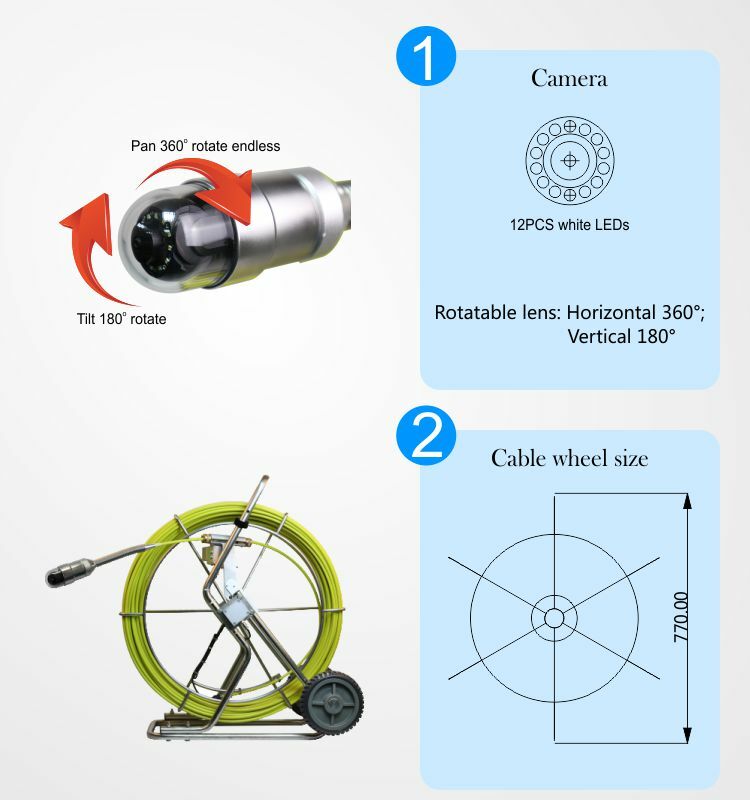 WPS rotation focusing lens, rotating lens diameter 51mm, radial 220 degrees flip, axial infinite rotation, can be electrically focusing (unique function), using 1/3cmos photosensitive chip, 700TV line, with 16 high-power LED lighting, IP68 waterproof standard, can prevent 10 meters water depth; Video detection of main steam piping. WPS-37R rotation focusing lens, rotating lens diameter 37mm, radial 220 degrees flip, axial infinite rotation, can be electrically focusing (unique function), using 1/3cmos photosensitive chip, 700TV line, with 10 high-power LED lighting, IP68 waterproof standard, can prevent 10 meters water depth; suitable for connecting box , the main steam pipeline video detection. WPS-21 wide-angle lens diameter 21mm, with 12 high-power LED lighting, IP67 waterproof standard, suitable for superheater, water wall and other pipeline internal video detection. GFRP Retractable wire plate, 25 m hard quality inspection line, line diameter of 5.5 mm. The new 5.8-inch color liquid crystal display is portable and durable. 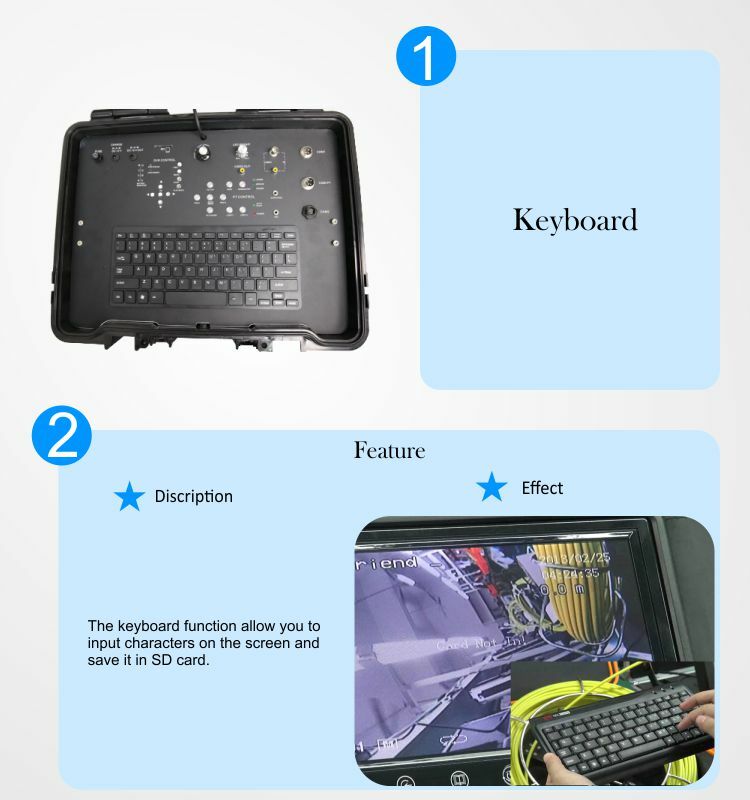 Dustproof Control Panel, light touch button for dimming, focusing, rotation and flip control. Flip angle LED indicator, with high-performance lithium battery, can continue to work under full power for more than 5 hours without external power supply. The host can be integrated photo, video function, for the judgment to provide timely, detailed picture evidence. 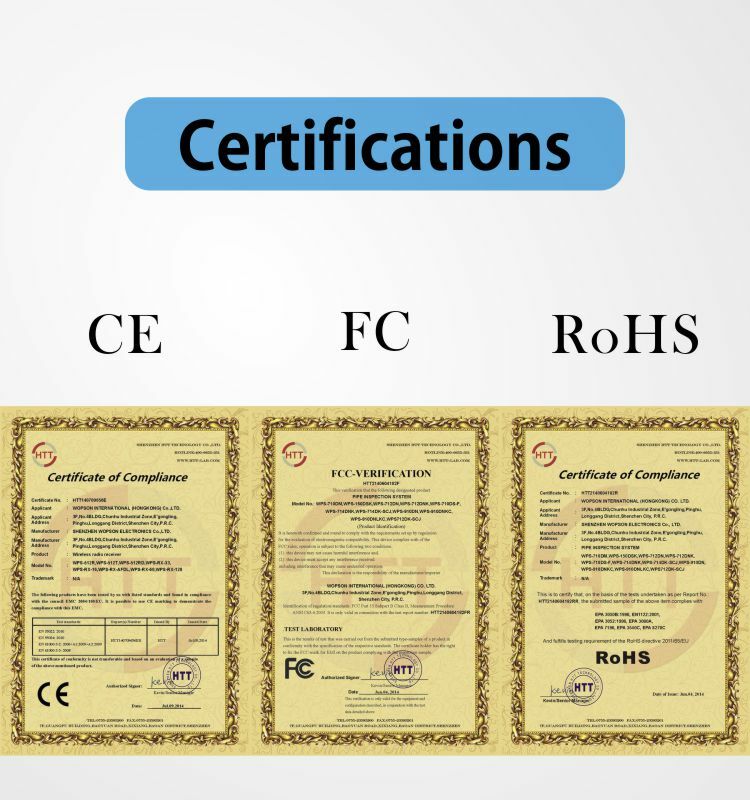 This series of pipe detectors are suitable for diameters of 18 mm to 1000 mm, the internal inspection of pipes, containers and larger equipment with a length of 25 m (maximum 100 m) can be used for rapid video diagnosis of cracks, cleanliness, weld connection, corrosion degree, collapse and internal abscission of the internal tube wall. 15 meters testing line, flexible, can be long distance delivery. The omni-directional rotating color lens, the optical angle of view big, the light source brightness is high, supports the long time continuous work, through the controller electric focusing can obtain the best detection image. Lens waterproof standard for IP68, withstand pressure of 5bar. 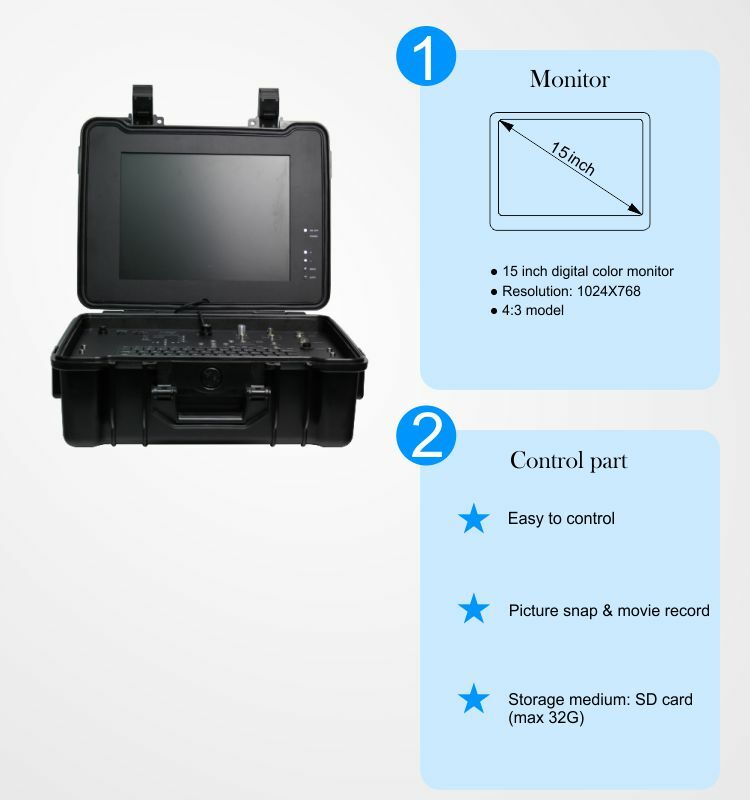 The tester consists of intelligent control lens, portable controller, GFRP Telescopic line plate, center device and so on.